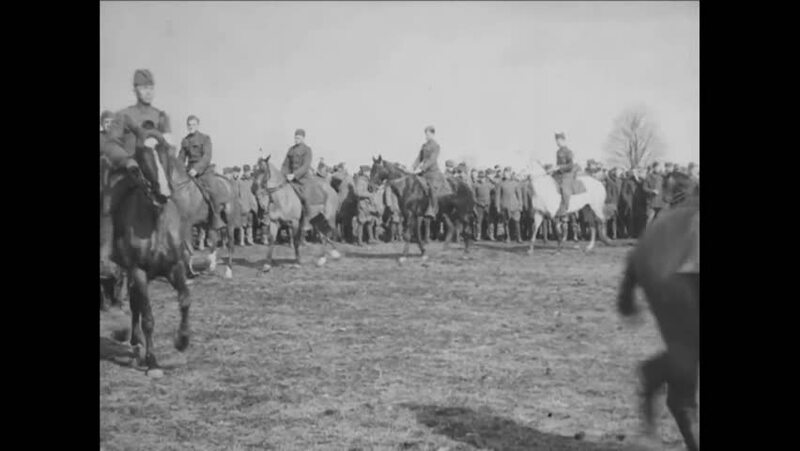 CIRCA 1919 - 6th Division soldiers prepare their horses for a demonstration. hd01:26CIRCA 1918 - General Charles Summerall inspects mounted troops and soldiers travel in horse-drawn wagons through France in World War 1.
hd00:40CIRCA 1918 - A military band performs with a conductor and at a dock facility in Bordeaux, France in World War 1.
hd00:35CIRCA - 1919 - President Woodrow Wilson and his party review troops as they enter a cemetery at Suresnes in France. hd01:44CIRCA 1910s - Troops march in preparation for World War one. hd00:36CIRCA 1910s\xD1 French girls place wreathes on graves and pay their respects. hd00:33CIRCA 1940 - Britain falls under heavy Nazi attack (narrated in 1945). hd00:30CIRCA 1918 - French infantrymen ride through Bordeaux on Bastille Day. hd00:49CIRCA 1950s - Farming and cattle and an irrigation system and a produce plant and a mining facility are shown in Israel.